Yemen’s landscape is indeed quite mountainous. Not many people have given Yemen’s majestic mountain ranges sufficient attention until a group of Yemeni and non-Yemeni friends took advantage of these unexplored peaks and started climbing mountains in Yemen to marvel at its often unexplored splendor. Nazar Nasher, 26, brings to Yemen one of the most interesting sports for the first time. He describes mountain climbing in two words as a “Challenging yourself”. 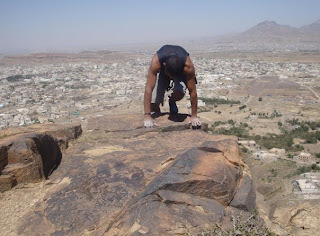 His current dream is to build an indoor climbing gym in Yemen and he is working on an initial coordination with the Ministry of Tourism to develop climbing places in Yemen and make them better for climbing and adventure tourism. “Yemen has lots of potential but not sufficient attention is given to it,” said Nasher. His most influential role models are Didier Berthod, a Swiss rock climber who has been featured in many climbing films, notably First Ascent, Dan Osman, an American extreme sports practitioner, known for the dangerous sports of rock climbing without ropes or other safety gear, and Chris Sharma, another famous American climber. Nasher excels at indoor & outdoor climbing, lead climbing, top rope climbing & bouldering. Mix magazine interviewed the young mountain climber on his passions recently.